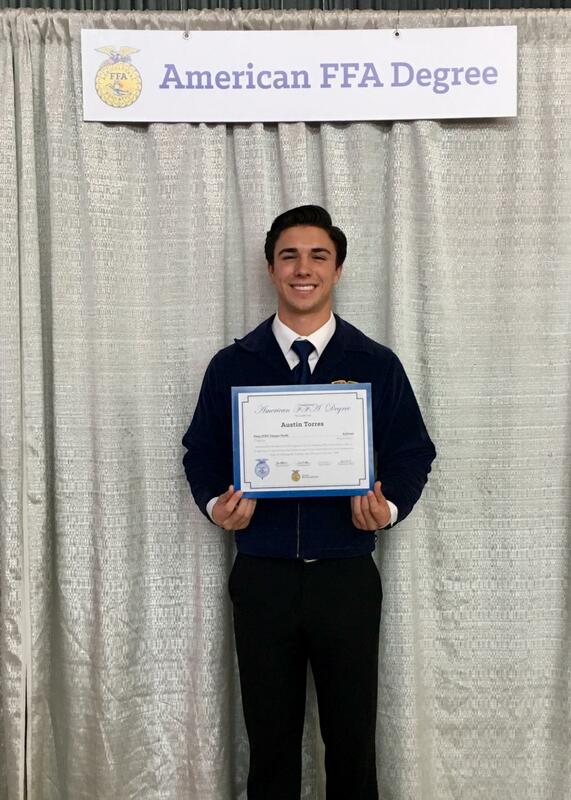 Congratulations to Tanque Verde High School graduate Austin Torres, who was awarded the highest recognition by the National FFA Organization - the National American FFA Degree! Each year, the National FFA Organization honors FFA members who show the utmost dedication to the organization through their desire to develop their potential for premier leadership, personal growth and career success through agricultural education. The American FFA Degree was bestowed upon a select group of students in recognition of their years of academic and professional excellence. This year 4,262 American Degrees were awarded. Austin Torres, a member of the Pima JTED Tanque Verde FFA Chapter in Tucson Arizona, was awarded the American FFA Degree at the 91st National FFA Convention & Expo Oct. 24-27 in Indianapolis. Austin is the 2nd FFA member from Pima JTED Tanque Verde FFA Chapter to receive this honor. Sponsored by Case IH, Elanco Animal Health and Syngenta, the award recognizes demonstrated ability and outstanding achievements in agricultural business, production, processing or service programs. To be eligible, FFA members must have earned and productively invested $10,000 through a supervised agricultural experience (SAE) program in which they start, own or hold a professional position in an existing agricultural enterprise. Recipients must also complete 50 hours community service and demonstrate outstanding leadership abilities and civic involvement. Each recipient of the American FFA Degree received a gold American FFA Degree key and certificate after being recognized on stage at the national convention.